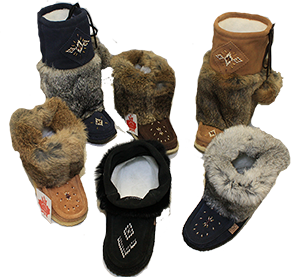 We’ve got 100’s of pairs of moccasins and mukluks, available in a variety of styles, colours and sizes. Made primarily of suede, sheepskin or fleece lining. Hand beaded, fur trimmed, several color options (solid or two toned). Some with crepe soles, ladies sizes 4-10. We also carry some moccasins for babies and infants in assorted colours and styles. Made primarily of suade, sheepkin or fleece lining. Hand beaded, fur trimmed, several colour options available. Available in several heights (very short, short, mid-calf).